Looking for a serene country setting, yet close to all conveniences? Look no further! 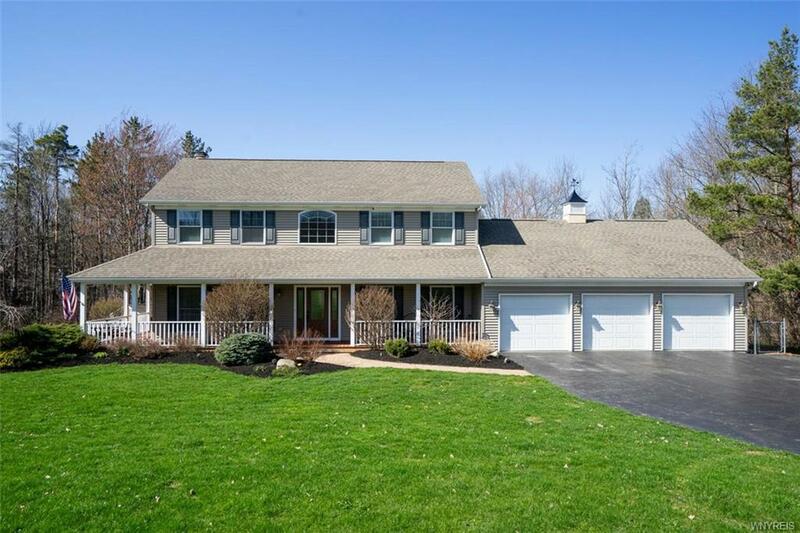 Nestled among trees this stylish colonial sits on 'almost' 3 acres. 2 story foyer provides access to the entire home without undue traffic through other rooms. Walk to rear of home to experience the popular open concept. Updated kitchen features: large island; granite countertops; stone backsplash; maple cabinetry & range hood; stainless steel appliances. LR has many windows to view outdoor beauty from inside, while staying cozy by the stone wbf. Master bdrm w/en suite. 3 other bdrms on 2nd fl. smallest bdrm currently used as laundry & exercise rm. Lower level boost 5th bdrm. w/full bath; walkout from family rm to patio. Plenty of storage; large shed; path cleared to enjoy creek. Call for more details. Listing information © 2019 CNYIS, GENRIS, WNYREIS. Listing provided courtesy of Boulevard Real Estate Wny.